Previous studies have demonstrated that a multitude of options can lead to choice overload, reducing decision quality. Research also shows that an excess of choices often leads us to be less, not more, satisfied once we actually decide. As the number of options increases, the costs, in time and effort, of gathering the information needed to make a good choice also increase. The level of certainty we have about our choice decreases. And the anticipation that we will regret their choice increases. According to Sheena Iyengar "... all of these techniques are designed to help you manage your choices -- better for you, you can use them on yourself, better for the people that you are serving. Because I believe that the key to getting the most from choice is to be choosy about choosing. And the more we're able to be choosy about choosing the better we will be able to practice the art of choosing." In Japan, it's attractive for a woman to have what's known as an "Ochobo" — a small mouth that one politely, and modestly, covers when open in public. This trend of having a "small and modest mouth" - has caught on to the point where it's considered rude for women to open their mouths wide in public. Freshness Burger found that the "Ochobo" trend was affecting sales, with their largest 'classic burger'. This classic burger had been selling like hotcakes with the male customers but not with the ladies. 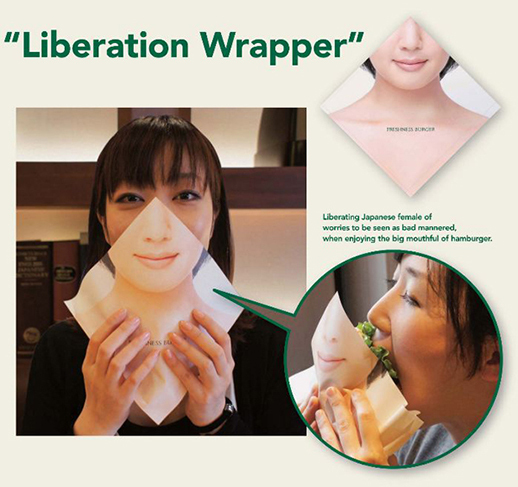 So Freshness Burger and Dentsu invented what they have dubbed a "Liberation Wrapper," a burger wrapper that doubles as a face mask with the picture of a woman smiling politely. Freshness Burger reported that sales of their large Classic Burger to women have increased by 213 percent since introducing the new wrapper.